WNB Immobilier conseiller immobilier mediates and advise you on the purchase of your French house. We have a spacious experience: 16 years of mediation and guidance of buyers and sellers in the French real estate sector. We can also advise and mediate for you as a buyer. If they find a house themselves? Then we can provide the full settlement and legal guidance. In addition, we have great architectural knowledge gained over many years of building and advise in the specific French construction, but also with knowledge of affairs from the Netherlands. The French law has decided on 10/01/2017 that the present barème must be respected and is not negotiable. 2. The valuation of your property for any other reason than for the sale. Costs € 450,= for houses with a value up to € 90,000,= above 5 per thousand of the liquidation value. Why buy in the Haute-Saône? The unfamiliarity of the region makes the choice and the price attractive. The landscape, with a rich history is lovely and hilly with many forests, sources, streams and rivers. In short, an ideal environment for the nature lover, you can go hiking, cycling, swimming, canoeing, golf and winter sports activities. A true nature reserve, also known as the Tuscany of France. The continental climate, which is characterized by a general mild and beautiful autumn, hot dry summers, while the winters are strict. So all the ingredients for beautiful holidays or longer stay without the haste and the stress of normal life. And not the slightest reason: the local population is friendly and helpful. Our mediation and advisory office is located in the beautiful village of Bousseraucourt; this village is located in the Haute-Saône at the foot of the Vosges Mountains. The area of the three provinces, Haute-Saône ( Franche-Comté ), Haute-Marne ( Champagne-Ardennes ) and Les Vosges "the Vosges" (Lorraine). All our houses are located in a radius of about 60 km around this town. 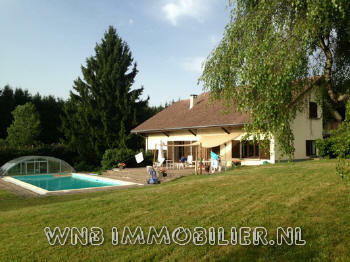 A beautiful detached villa with great garden and swimming pool in the sector of Remiremont. a beautiful, large, former rectory next to the church, with a beautiful landscaped garden and wonderful views on the Vosges. 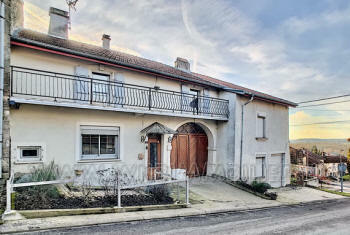 Located in the beautiful village of Enfonvelle a renovated house with barns and spacious conservatory. A beautiful former winery with high quality renovated house and many outbuildings.